Their Two Worlds Couldn't Be Further Apart. Can Anything Bridge the Divide Between Them? For years Zane Beck and his Amish neighbor Lila Lehman were best of friends. But just as Zane gathered the courage to discover if their friendship could develop into something more, her controlling father arranged for her to be courted by their bishop's son. Zane, heartbroken and frustrated, joined the Army, running away from his shattered dreams. The passing of time and the distance between Zane and Lila haven't been enough to halt their--now completely hidden--feelings for each other. Any hope for their love grows even more impossible though as Zane's service takes a dangerous turn when he's deployed to Afghanistan. Being on the frontline, confronted with the hard choices of war, has him questioning everything, including whether he can continue to serve or not. But all choices have consequences, and with Lila preparing to marry another, will these one-time sweethearts ever find the life together that they both still long for? Amish Sweethearts is the second book in Neighbors of Lancaster County series, but the first book of the series I have gotten the chance to read and I really enjoyed it. It puts a new twist on the "star-crossed lovers" story line that is refreshing and deals with a lot of modern themes. You get a good view of life through the eyes of both the Amish characters and the Englisch/military characters. The characters are easy to love and you find yourself rooting for a happy ending for all involved. There were a few twists and turns that I wasn't expecting which really helped to deepen the story. 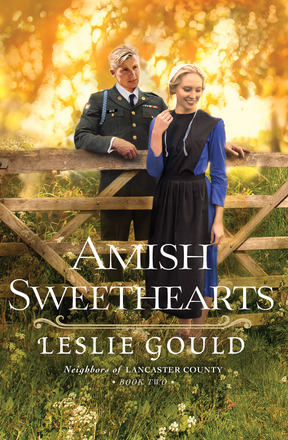 As the wife of a soldier who was deployed for 18 months shortly after we married, this one really tugged on my heartstrings:) Leslie Gould is obviously well-versed on both the Amish and the military and modern conflicts, which creates a super realistic atmosphere for Amish Sweethearts. Even if you haven't read the first book in this series, you will likely love Amish Sweethearts!